Beyond providing data for all 32 NFL teams, PFF also supports network broadcasters with game-preview packets that are used to enhance the in-game experience for fans and viewers. 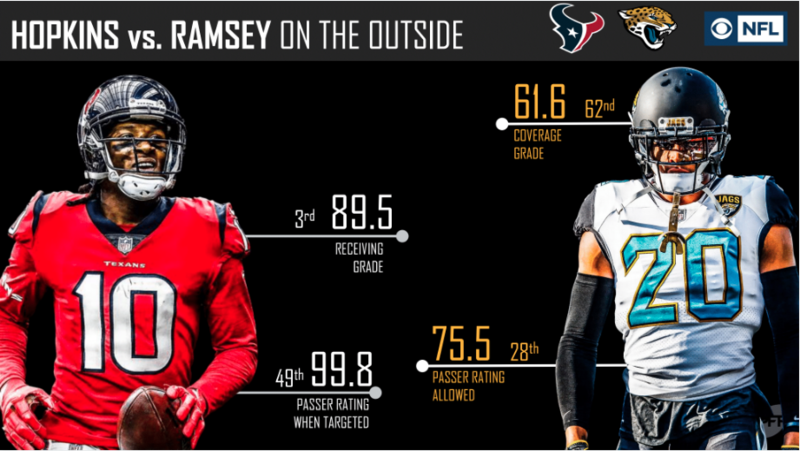 This Texans-Jaguars preview features the same information our broadcast partners use for team research and in-game production. 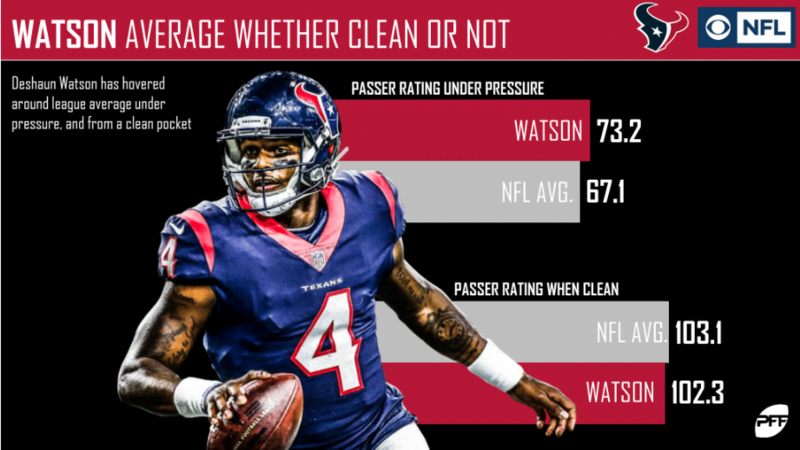 In seven games in 2017, Deshaun Watson had the league’s highest passer rating from a clean pocket at 124.1, while his 70.9 passer rating under pressure was close to league average. So far this season, his 102.3 clean pocket passer rating has been near-average, as has his 73.2 passer rating under pressure. 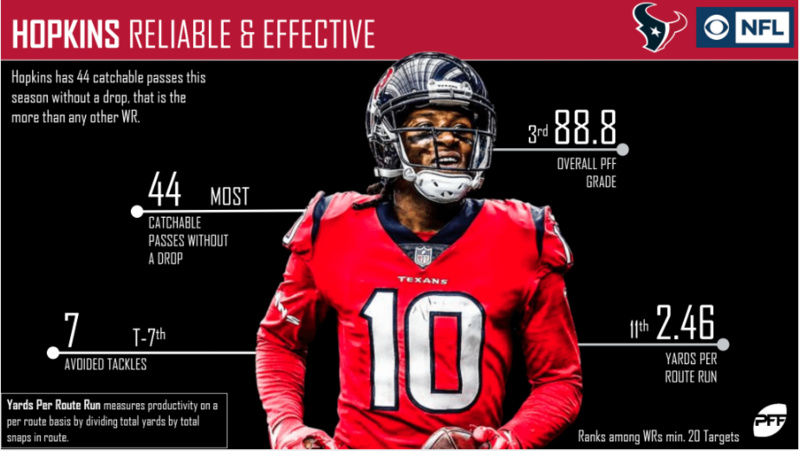 Deandre Hopkins has been a quarterback’s dream in 2018, catching every one of the 44 catchable passes thrown his way. He’s also been extremely efficient with the ball in his hands, as his 2.46 yards per route run is 11th among qualifying wide receivers. 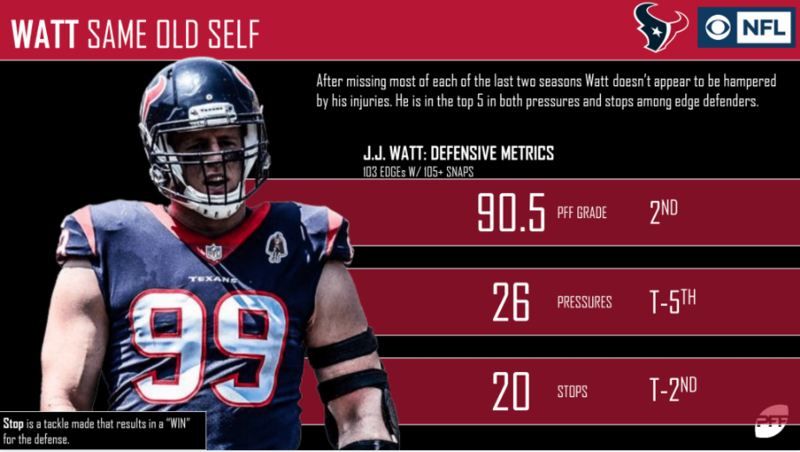 J.J. Watt has returned to his dominant ways after two injury-plagued seasons. He owns PFF’s second-best overall grade among edge defenders at 90.5, and his 26 total pressures rank fifth. He also has 20 defensive stops, second among 103 qualifying edge defenders. 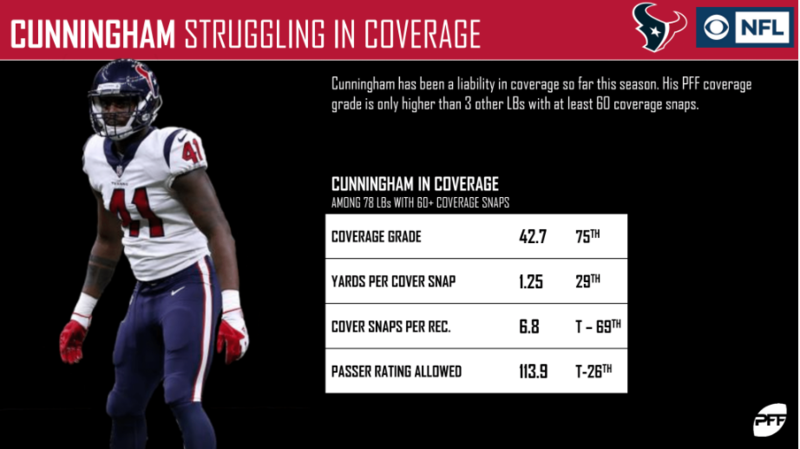 Zach Cunningham has seen a notable dip in his performance in coverage. Through six weeks, his 42.7 coverage grade ranks 75th among 78 qualifying linebackers, and his 1.25 yards allowed per snap in coverage is 29th among the same group. 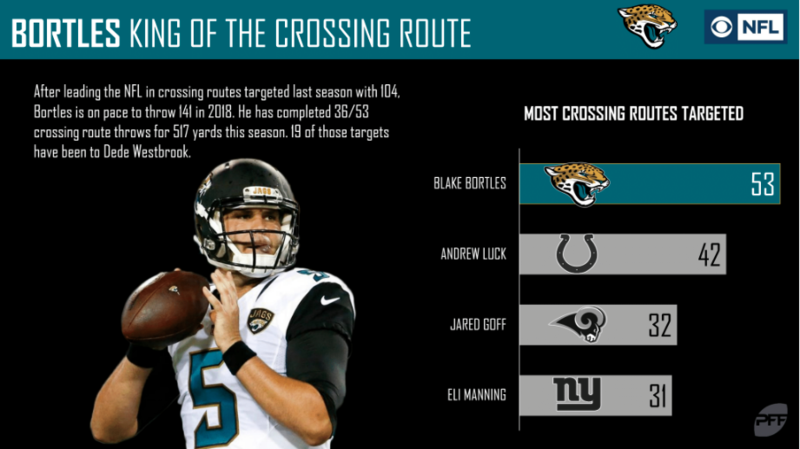 Blake Bortles never met a crossing route he didn’t like, having led the league last season with 104 crossing routes targeted. He’s already completed 36 of 53 crossing route targets in 2018 for 517 yards. 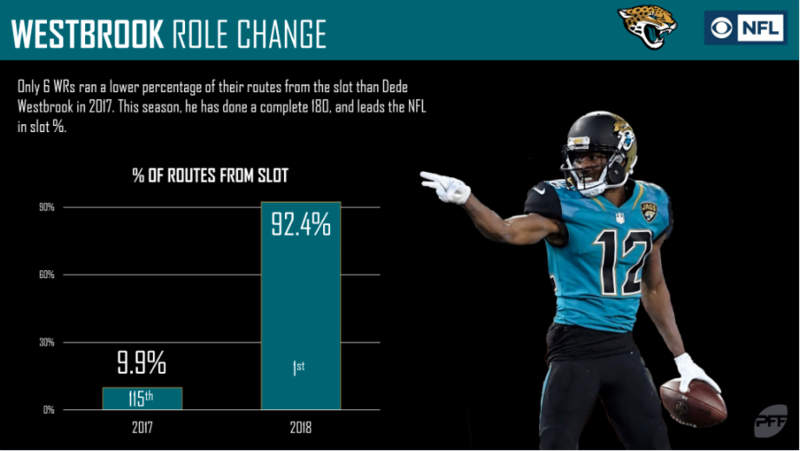 Dede Westbrook ran only 9.9% of his routes from the slot in 2017, the third-lowest percentage in the NFL. This season, he’s leading the league in slot percentage 92.4%, and the change has served him well. 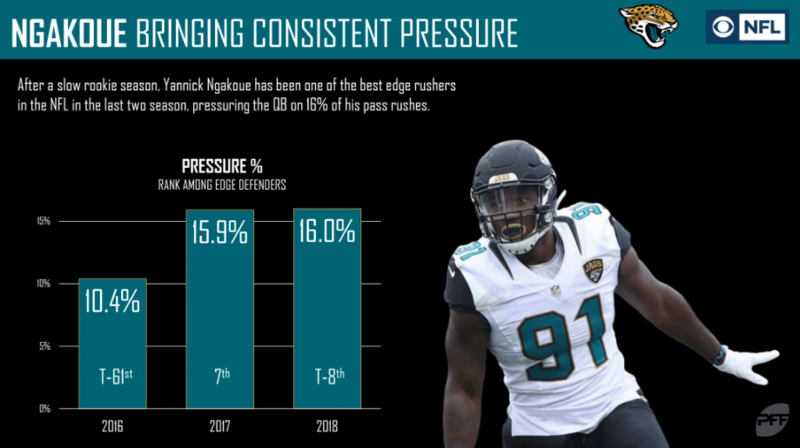 Yannick Ngakoue may be establishing his baseline in pressure percentage, as 16.0% of his pass rushes in 2018 have resulted in quarterback pressures, following the 15.9% figure he posted in 2017. These percentages placed him seventh and tied for eighth among edge defenders in 2017 and 2018, respectively. 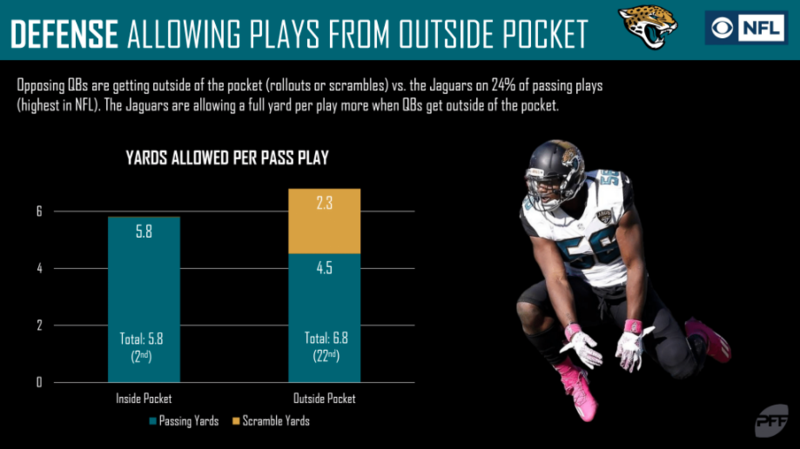 The Jaguars defense has been more vulnerable to passes thrown outside the pocket than inside, allowing a full yard more per play when a quarterback rolls out or scrambles. They’re also allowing opposing quarterbacks to escape the pocket on an NFL-leading 24% of passing plays, so containing the quarterback would seem a likely focus for defensive improvement.